Meet Vinod Sachdev - A Digital Marketing Consultant by profession and the face and brain behind the projects delivered by Digital Centrics. As a Digital Marketing Consultant by profession I provide Custom Website Design and Development, Custom Landing Page Design and Development, Google & Bing Ad Campaigns, Conversion Rate Optimization services to clients across USA, UK, Spain, Caribbean Islands, Dubai, India & other regions the globle. I am also colabrated with other small & medium digital marketing companies in India as a liased between their internal team and clients after signing an NDA with them for providing - Project co-ordination, creating digital banners (for paid ads and affiliate marketing campaigns) & client co-ordination services for their client(s). 250+ Clients Served - Across USA, UK, Spain, Canada, Caribbean Islands, India & more..
Digital Centrics provides solutions to businesses that want to dominate their competition. Whether you’re a small business, medium or a large business house, or somewhere in between, Digital Centrics is here to serve you and achieve success in digital industry. Digital Centrics values what’s beneficial for our clients in everything we do. Digital Centrics respect it's clients, understand their requirements and bring satisfaction through the services delivered. 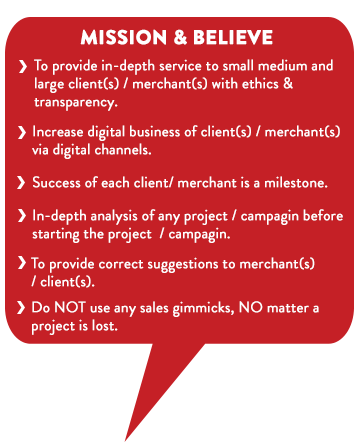 For Digital Centrics success of each client is a milestone. It's Not About Digital Centrics. It’s about YOU. Digital Centrics job is to bring attention to your business. Digital Centrics shares experience and knowledge to serve you after understanding your requirements and provide solutions to fit your budget with ethical service to build long-term relationship.